By the end of January, most people have abandoned their well-intentioned New Year’s Resolutions. Maybe your goals were too lofty or maybe life just got in the way. Or maybe, you just needed to hear from someone who has struggled with the same resolutions and finally found a way to break through. Jodi, do you have any suggestions for avoiding “emotional eating”? As far as emotional eating, it surely was a major contributor to my obesity. Food was my friend, so I thought, and I went to it for comfort.I learned that I could no longer turn to food for comfort, so I told myself whenever I needed “that comfort” I would walk instead. It may not be my normal walk, but it gets me out of the atmosphere and allows me to think about things. I also learned not to purchase the comfort food items. If they are here, then I may eat them … so I don’t keep them in my home. Low-fat microwave popcorn works great for comfort food – low in calories, high fiber and it keeps the hand busy. Most of the time, comfort food is not ‘tasted’ anyways … it’s just something to do. I know, I’ve been there. Jodi— I love edamames (and lucky for me, my kids like them too!) I usually eat them cold as a snack. I’ve found that some brands are often saltier than others. What are the major benefits of this bean and is good to eat if you’re someone who watches their carbs? Hi Kyle,I am jumping in on this one, only because I love edamame and grew up eating it. There are some brands that add salt to them before packaging. If you can find the ones that don’t I would recommend that. I buy mine frozen and there is no salt. 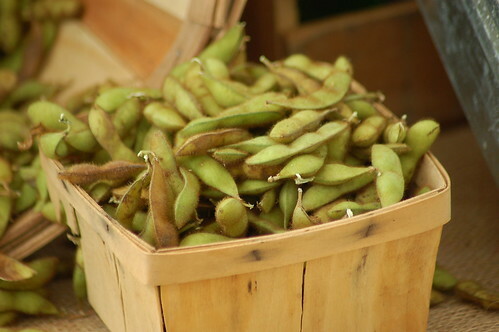 The beauty of edamame is that it has some carbs, fiber, heart healthy fat and protein. A half cup – 188 calories, 8.7 grams total fat (7.7 grams are heart healthy fats), 14 grams of carbs, ~5 grams of fiber, ~17 grams of protein and naturally only has 19 mg of sodium. This is only one serving of carbohydrates, so would be very doable for someone counting their carbs. I hope that helps. To see the full chat, be sure to check out this article on MLive and scroll to the comment section at the bottom of the page. ‘You Looked Much Better When You Were Obese’… Really?